Based on a true story, A Letter to Dad is a Dove-approved DVD that tells a touching story of how forgiveness can overcome a lifetime of pain and anger. Following the life of Dan Donahue (Thom Mathews), this heart-felt film tells the story of a young boy abandoned by his father and the impact of his father's actions on his life. On the night he is going to propose to the woman of his dreams (Megan Gallivan), Dan is suddenly overcome by a deeply rooted anger toward his father. Pouring out his heart in a letter to his father, Dan confronts the past and the painful events of his childhood. 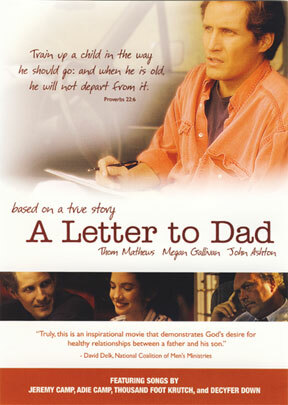 Culminating in a dramatic one-on-one meeting, this Christian DVD shows how Dan's father (John Ashton) must face his own failures as a father and the son he left behind. In turning to God, Dan finally realizes the only way to love is to forgive. Featuring a soundtrack with standout Christian artists Jeremy Camp, Adie Camp, Thousand Foot Krutch, and Decyfer Down, A Letter to Dad is an inspirational story that reveals how we must confront our past in order to move forward.